All sites contain sample pages in the _sample-pages folder in the asset tree. Sample pages serve as real-time examples of the different page types available. Sample pages are useful for a variety of purposes: use as a tool for understanding page layout, take an in-action look at how special page types work together, and use as a starting point for building new pages. Follow the suggestions below for how to use sample pages. In addition to understanding page layout on the front-end (see CMS 101: Tour the Templates), understanding how pages are built in the back-end is fundamental for all website managers. Sample pages let you see how page layout is established in the CMS; enter edit mode on any of the sample pages to see how the various components comprise the page. Special page types contain added functionality to auto-populate content on certain directory-type pages. 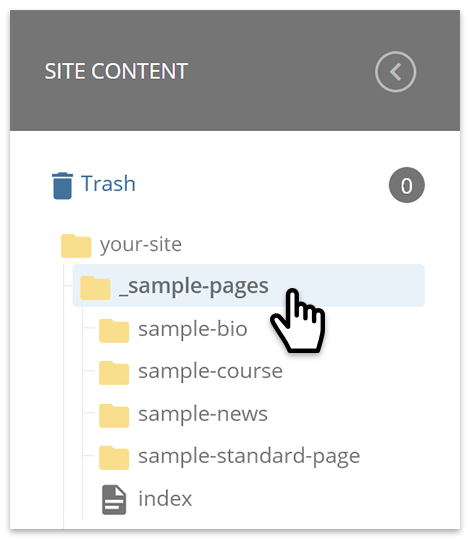 Sample pages are available for all Bio, News, and Course pages; learn how the pages work together and test things out by creating new pages in each section. Like what you see? Copy it! Sample pages can also serve as a starting point for a new page you want to create on your site. If a sample page contains a layout you would like to duplicate, copy it to an appropriate location on your site and modify it as needed. Perhaps your department has set guidelines that dictate content layout or design elements. Or maybe you have been tasked with creating multiple pages that are very similar but you don't want to have to start from scratch each time. Here's where creating your own page templates can make your life a little less stressful! Not only will you be making your workflow faster and more efficient, you can ensure consistency and accuracy is maintained throughout your site, especially when there are too many cooks in the kitchen.